Thanks loads to PastaQueen for putting me on to this wonderful cartoon. I think I'd move the easy & untasty three upwards - I happen to like them - but otherwise I couldn't agree more. 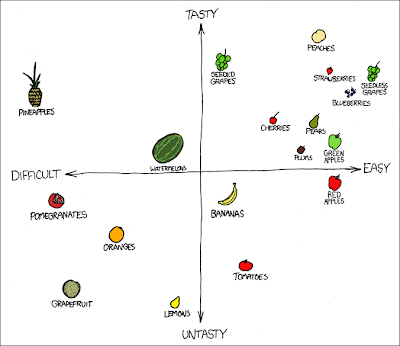 It comes from the awesome xkcd.com ("A webcomic of romance, sarcasm, math, and language"). Apart from the math, sounds like my kinda guy.